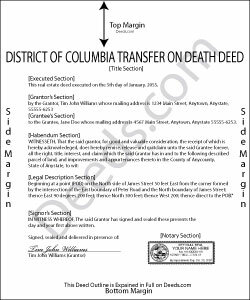 Owners of real property in the District of Columbia now have access to a useful estate planning tool: the transfer on death deed (TODD). Modeled after the Uniform Real Property Transfer on Death Act and located at D.C. Code 19-604.01 et seq (2013), this statute governs the use of transfer on death deeds in the District of Columbia. Transfer on death deeds are nontestamentary (not using a will) instruments that allow transferors/owners to retain absolute ownership of and control over their land during their lives ( 19-604.07). Because they deal with after-death assets, however, their execution requires the same level of competency as a will ( 19-604.08). The owners may sell, mortgage, rent, or otherwise use the real estate however they choose, with no penalty for waste or obligation to notify the beneficiaries ( 19-604.12). By recording the executed TODD, property owners may also take advantage of one of the most unique aspects of these instruments: revocability ( 19-604.06). Revocability is possible for two primary reasons: there is no obligation to notify the beneficiaries about the potential future interest they stand to gain when the owner dies; and these conveyances generally do not involve consideration (something of value given in exchange for the property) ( 19-604.10). The statutes provide several methods for revoking a TODD. The owner may execute and record a new TODD, cancelling the prior deed and designating a different beneficiary. The owner may also sell the real estate to someone else using a standard inter vivos conveyance such as a warranty deed or a quitclaim deed that contains a comment revoking the TODD. A third option uses a revocation form, which, after recording, cancels all previously recorded TODDs ( 19-604.11). In much the same way that owners may wish to change or revoke a beneficiary designation, sometimes beneficiaries are unable or unwilling to accept the property after the owner dies. To address this need, beneficiaries may disclaim all or part of the interest in land ( 19-604.14). TRANSFER ON DEATH DEEDS AND ASSOCIATED REVOCATIONS MUST BE RECORDED WHILE THE OWNER IS ALIVE OR THEY HAVE NO EFFECT. Overall, TODDs offer a useful, flexible estate planning tool to owners of real property in Washington, DC. Before committing to a TODD, consider the effect it will have on taxes, access, and eligibility for income-and/or-asset-based benefits. Each situation is unique, so for complex circumstances or additional questions, contact a local attorney.